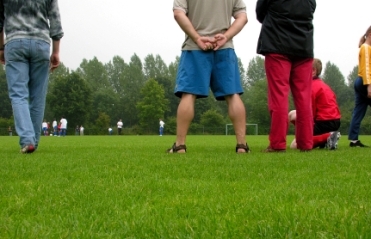 Over-Involved Youth Sports Parent: Are You One? Does enjoying your Saturday afternoon and evenings depend on whether your daughter won her soocer game that morning? Do you find yourself lying awake at 3 a.m. wondering whether your son will be the star this sports season, or will even make it off the bench? Have you ever brought a pad of paper to your child's game to keep track of the errors your child made so you can tell her about them on the way home in the car and spend some extra time working with her on eliminating them? Are you in a bad mood after your child loses and in seventh heaven after he wins? If you answered "yes" to any of these questions, you are an over-involved parent. Children feel awkward and uncomfortable if their moms and dads listen to their music, where their style of clothes, or use their slang. They feel the same way when their parents become over-involved with their school; friends or other leisure sports activities, especially sports. Be warned: if your child feels like what he is doing has become too big a part of what you are doing, he may ask you to stay home! Worse yet, too much parental involvement can stifle a child's enjoyment of the sport and cause her to quit altogether. Are You An Over-Involved Youth Sports Parent? Children and teens are uncomfortable if parents listen to their music, wear their style of clothes, or use their slang or become over-involved with their school, friends or sports. Here are some warning signs.